Parliament Palace in Bucharest. It's huge, but I'm not, honest. Have you ever been surprised to find yourself somewhere on the planet in a place you never thought you’d be? See me taking this picture? I was thinking how strange and unexpected it was to stand there, in that place. 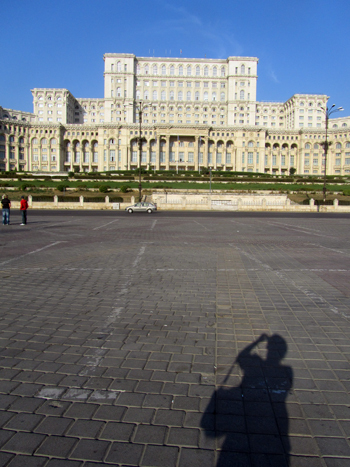 As a kid growing up in Holland I dreamed of traveling to exotic countries, but standing in front of the infamous Nicolae Ceausescu’s House of the Republic, now called the Parliament Palace, in Bucharest, Romania, never was on the list. But there I was a couple of weeks ago, gawking at this enormous white building thinking deep thoughts, contemplating the meaning of life and wondering where the next “toilet stop” was digesting what our guide had just told us. In order to build this Parliament Palace, Ceausescu had the entire area and acres and acres of space around it bulldozed, destroying 12 churches, 2 monasteries, 2 synagogues and thousands of private houses, many of these buildings of great historical and cultural importance. I never knew this. Now, it won’t change my life to have added this to my store of knowledge, but standing there in this place and looking around gave knowing this another dimension. And here another question for you:Where were you on December 25, 1989? Having Christmas dinner with your family probably. And while you were checking on your Butterball turkey roasting in your oven, or eating your Mum’s mincemeat pie, Nicolae Ceausescu and his wife Elena were executed in Romania. Onward to another place I’d never thought I’d visit: Transylvania. So how did I get there? Same way I got to Bucharest: I was tagging along on a fam tour, aka a familiarization tour for travel agents and tour operators (see last week’s post) offered to me free of charge by Cultural Romtour. Are you fascinated by the Dracula myths? Are you a vampire fan? Do you love reading vampires stories? Please forgive me, but I don’t get it. Never read the books, didn’t know a thing about it. And so I deserved what I got when I traveled to the birth place of Count Dracula, aka Vad the Impaler. Read on. Dracula’s castle is in Brasov, Transylvania. We drove past the town and never saw the castle. Our lovely guide Victoria waved her hand in dismissal. It was just a scam, she told us, for the tourists. There is no historical evidence that Vlad the Impaler was ever there at all, no account of his spending even a night there. Of course the tour operators in our group could add it to an itinerary for their clients, but we weren’t going to waste our time going there. We would, however, visit the 12th century town of Sighisoara and visit the house where Vlad’s long-suffering mother gave birth to him, may God have mercy on her soul. That at least was historically correct. Maybe. I took a picture of the house, a modest yellow building, restored to its historical identity so we were told, but we never got in: See the black screen? It was there to keep people out because there was a film crew busy making a movie. A movie about Vlad that I’m sure I’ll never see, but it was fun seeing the actors in their costumes milling around, and we heard a rumor that Gerard Depardieu was in the film, but we didn’t see him. Neither did we get into the Clock Tower, which you can see on the photo below, closed because of, you guessed it, the movie. It houses a museum that we were meant to see, but alas, no matter how Victoria tried, we couldn’t get in. So we all ended up touring the town which is fairy-tale romantic with its cobbled streets and Saxon architecture. Thick walls surround the Citadel (old town), built during the 14th and 16th centuries to protect it against Turkish invaders. There’s a lot of history here which I’ll leave you to google if you want, since I am not a travel writer. In the center of the Citadel we visited a brandy and liqueur maker and had a gustation of a whole array of yummy spirits which cheered us all up, as you can imagine, and we hadn’t even had lunch yet. We bought bottles and bottles of the lovely nectar to take home with us. So not all was lost, but then I didn’t really care anyway since I’ve never been enamored of Vlad the Impaler. But the town, now that was fabulous. Note: My title was taken from a famous children’s poem by Dr. Seuss, and you can read it here. Have you ever been surprised to find yourself in a place you’d never thought you’d visit? How did you get there? Well, I never thought I’d visit Sicily, let alone live here! It just happened…. I like the way you have reminded us that sinister things happen in beautiful places, and often at times when others are celebrating. Again a great story and interesting points that indeed make me reflect on myself and think where I have been, and where I might go. Vlad Tepes: I red a University Study of Boston University book about life of Vlad Tepes (de impaler) and he was pretty brutal and it makes me think of a more recent “tourist” attraction I visited in Gori Georgia, the house and village and museum of Stalin! It was a very strange feeling to visit that place! What a fascinating place. Transylvania is definitely on my list of places to visit. Fascinating Fam tour, indeed! I just love that clock tower..
Lovely post, just heartbreaking to know that Ceausescu tore down what probably looked like Sighisoara in Bucharest and then replaced it with that horrible structure in the first pic. He deserved to go the way he did. I am sooo jealous right now! (Just read a book that told me to embrace my negative emotions, so don’t mind me 😉 ! ) Seriously, that’s awesome. I’m not a vampire fan myself but one of my Romanian friends gave the kids a copy of a scholastic book about Vlad the Impaler, which I read, so I did know a bit about the history. And I was amazed that I ended up in the Sahara desert. Again, not a place I’d especially wanted to/planned on going, but very cool nonetheless (metaphorically speaking. Actually it was a furnace). I never thought I’d end up at the Olympics in Sydney! Leuk van je te horen! Jouw verhalen vind ik ook altijd interessant vooral omdat jij “echt” in Libanon woont, en niet zoals ik en andere expats een paar jaar hier en daar. Het is toch anders. Very good post and very good question. I visited plantations of tea in Sri Lanka when I lived there for three years. It was beautiful. I would never have thought that one day I would be there. Thanks for for your blog. I’m afraid that I’ve planned most of my trips, but I’m open to going anywhere, anyone takes me. How interesting to see and read about Ceausescu’s palace and how it destroyed other buildings. Also, I am curious how you were invited on this FAM tour. I thought you had to be a travel agent to do that. Wish you had seen Gerard Depardieu. Were the actors speaking French, or didn’t you get to hear them on the street? Thanks for a fabulous tour. Yes, I think that all the time! I come from a small town in the Netherlands, but knew at a young age that Holland was too small for me and I wanted to go far and to exotic places. And indeed as an expat I end up in places I haven’t dreamed off. Living in South Africa for example… was not on my list, but now I love it!! Like the other 5 countries I lived in… magical life, this expat life! !